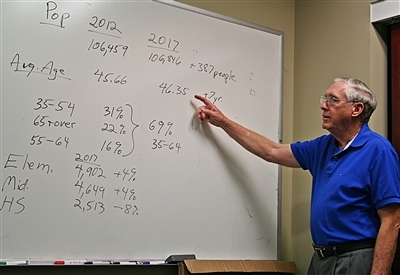 United Methodist churches across Florida are mining an online database and finding a treasure trove of demographic information that is helping attract new parishioners. The Florida Conference pays $8,700 a year for the MissionInsite database, making it free to use for any UMC member in the state. First UMC, Coral Gables, has been using the program since November with a view toward attracting a more diverse congregation. “The information is excellent in laying out the broad strokes,” said Greg Alt, who chairs the church’s administrative council. 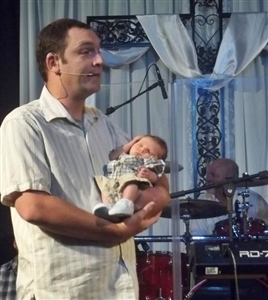 Pine Ridge Fellowship pastor Ben Stilwell-Hernandez is among church leaders who use the MissionInsite database to design new church programs that appeal to the surrounding community. Photo from Pine Ridge Fellowship. Collecting demographic information from a variety of sources, including the U.S. Census Bureau, MissionInsite combines data into a comprehensive, user-friendly format that can be used to paint an accurate social, economic or religious portrait of almost any community in Florida. Thinking of starting a mission to feed the hungry? MissionInsite reveals the neighborhoods where those people live and how many are within a 5-mile radius of the church. Targeting young families? The database can help pick the ZIP codes for an effective mass mailing. Considering a GED program for the unemployed? MissionInsite knows where they live in your area. “This is a phenomenal tool,” said Rev. Dr. Mont Duncan, executive director of New Church Development for the Florida Conference. Surrounded by large Hispanic and African-American communities, as well as a large student population at the University of Miami, First UMC, Coral Gables, is using MissionInsite to plan outreach. “We know we have a great pool of potential disciples in this area and [MissionInsite] is a great tool to identify them and develop strategies of how to reach out and bring those people in,” Alt said. Alt is part of a demographic task force formed in November after Duncan made a presentation at the church on MissionInsite’s use. “Our church is in a very affluent area of Miami but we are casting the net wider to include a rich, diverse community,” Alt said. The database also provides insight on a community’s religious makeup via the Quadrennial Project, a national religious survey of Americans' beliefs, preferences and practices. This state of faith report was released last year. “Let’s say a church decided it wanted to reach people with little or no faith. This report can show where those people are in a community,” said Duncan, 12 years at the helm of the New Church Development office. Mont Duncan, executive director of New Church Development at the Florida Conference, discusses a MissionInsite report generated for Christ Church, Fort Lauderdale. Photo by Susan Green. At Pine Ridge Fellowship in Deltona, Pastor Ben Stilwell-Hernandez finds two parts of the program particularly helpful: Quadrennial Reports and the Congregant Plot. The Quad Report “allows us to look deeper and broader into the households in a designated area to provide even more information than the pure demographics. … It is pretty eye-opening,” Stilwell-Hernandez said. The Congregant Plot also lets a pastor see neighborhoods where his or her flock is concentrated. “This is helpful to know as we plan for community events and outreaches as we can pick where we go and don't go as a church,” Stilwell-Hernandez said. “MissionInsite is especially useful in discovering new ministry opportunities,” said Chuck Salter, an ordained Methodist elder and president of MissionInsite. Local churches also use the service to assist church leaders in development of effective ministries based on current and projected demographic trends, Salter said. A church that wants to start a daycare should know how many young children live nearby, for example. Salter sees the goal as less how to market the church and more "how to bless the community." Duncan said he would like to convert more to the program. Stilwell-Hernandez is confident the software can help other churches, but he cautioned that it is not a cure-all.